The military response to the ultimatum issued by the South African Republic lay squarely with Britain. In their wisdom, the War Office, and Britain's generals believed they knew best how to prosecute the war. The local knowledge and military experience, albeit limited but critical, present amongst the residents of the Cape Colony and Natal was largely ignored. Not surprisingly this upset "the colonials" and by then end of 1899, after "Black Week", three towns besieged the New Year looked bleak. The arrogance of the British military establishment was a source of embarrassment. The War Office realised new blood was needed and they appointed Field Marshal Lord Roberts to replace Major-General Sir R Buller, VC, as Commander-in-Chief. Lord Roberts and his energetic deputy, Lord Kitchener, arrived in Cape Town on January 10th, 1900. They had much work to re-organise and re-energise the battered British forces. Crucially, they realised the contribution "the colonials" could make to future military success. Roberts authorised further mounted units be raised; Roberts' Horse and Kitchener's Horse. A Colonial Division was formed, commanded by the newly promoted Major-General EY Brabant, a veteran of the Cape's earlier wars. They were to do sterling service, not least in the successful defence of Wepener in April 1900. Roberts' public relation offensive included a public face, about five days after arriving he asked Major DT Laing to raise a bodyguard composed of selected men from colonial units. Major Laing was a veteran of the Argyll & Sutherland Highlanders who had settled in southern Africa. he had fought in the conquest of Matabeleland in 1893 and commanded the Belingwe Field Force. Laing understood both the British Army and the colonial fighter. The initial strength of the Bodyguard was 40 men, enrollments began on January 23rd, by February 1st 40 men had been signed up. Those men whose parent unit has not been traced must have had previous military service in southern Africa and be known to Major Laing or recommended by men he trusted. There is very little written about the recruitment of the Bodyguard, what we know has been derived from the medal rolls (WO100) and nominal rolls (WO127). 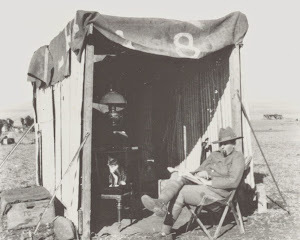 The Bodyguard obviously accompanied Lord Roberts' on his great march from Orange River Camp to Belfast via Paardeberg, Bloemfontein, Johannesburg and Diamond Hill. Seventeen also earned the Relief of Kimberley clasp, why they were separated is not known. On 25th October, 1900 Britain marked the annexation of the South African Republic with a large parade in Pretoria. The Bodyguard were one of four units representing "the colonies". [Dundee Courier 29-10-1900] The St James' Gazette reported on 28th November, 1900 the "Kimberley contingent" left that town by train following an address from the mayor. Their destination was not shown. In late 1900 Lord Roberts handed over command to Lord Kitchener and left in December. Before he left Roberts asked Major Laing to raise a regiment known as "Commander-in-Chief's Bodyguard". The Bodyguard was dissolved, a few men stayed with the new regiment, the majority returned to their parent units. Over the time the Bodyguard existed a total of 52 men served in the unit, one just for 3 days. Most served into October 1900 when most transfers out began, the last man transferred out was on December 11th. The last man transferred in was on June 14th and he served for six months. These 52 men earned 25 clasp combinations; the most common clasps are Paardeberg, Driefontein, Johannesburg, Diamond Hill, Belfast and Cape Colony - the clasps awarded Lord Roberts himself. Others to be found are Belmont, Modder River, Relief of Kimberley, Elandslaagte, Relief of Mafeking and Defence of Ladysmith and Wittebergen. These men truly represented the breadth of Colonial service in the war. For the full list of men who served check this PDF. The group to MJ Paxton, Kaffrarian Rifles, Cape Colony Cycle Corps and in WW1 3rd SAMR and 8th SA Horse.